Did you know that there are certified equine massage therapists? It should not be surprising, considering that whether human or horse, the muscles tend to get sore and a massage will oftentimes help the animal to relax just as it does the human. Obviously, if you decide to employ the skills of an equine massager, you will want to look for a certified individual to assure that the program that is being used will actually benefit the horse rather than just be a random kneading of the muscles. muscles are communicating, and you will find that an investment in this kind of treatment is actually worth its weight in gold, considering that you may save a lot of money treating recurring lameness or even shifting lameness when it is not a sore hock that is the root problem but instead a sore neck, back or shoulder that can be treated with some simple muscular manipulation. It is interesting to note that massage therapy is form of holistic approach, since it does not simply concentrate on one limb, but instead deals with the whole horse, and as such it is a valuable addition to veterinary care of the animal. Muscles actually appear as a network of circles that go from the head to the tail and also all four limbs, thus translating external pressures into symptoms of soreness in different regions of the body. Of course, aside from the treatment aspects, there is also the short term benefit of increasing the circulation within the animal’s system as well as the ability to ensure adequate movement of nutrition to reach locomotive and smooth muscles, once again aiding in the health of the overall bodily functions. 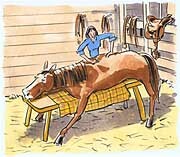 For the exercised horse, the massage will furthermore facilitate the removal of lactic acid, thereby reducing muscle soreness and discomfort. Even though this kind of treatment is not new but instead has been proven to have been practiced in ancient Rome and China, there are some veterinarians who think little of equine massage. They claim that there is no proof that this kind of massage does anything for the horse, and instead seems to simply be another way for horse aficionados to feel good about their ability to provide care for their equine companions. As a matter of fact, these detractors from the practice claim that there is evidence whatsoever to show equine massage improves circulation, helps with the healing of affected tissues, or prevents muscle soreness. Yet, in spite of this doubt, veterinarians on the whole are not ready to completely discount equine massage, considering that while it may not be proven to be effective for a variety of ailments, it has not been shown to be detrimental either. The one caution they do throw out is against those massage therapists who attempt to practice veterinary medicine in spite of not being licensed to do so. Read the next horse health tips article on Therapeutic magnets. For cutting and reining horse events, you definitely need a saddle that’s designed to help you "ride in balance and sit the stop." First, you want a saddle that was designed and built specifically for reining or cutting. Both of these designs have their individual advantages but remember, just because the manufacturer "calls" it a reining saddle doesn’t mean it was designed "well" for reining. Browse more horse training resources that will help you better train your horse.